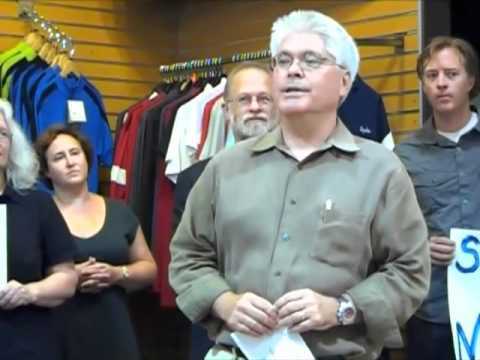 Clark Kepler, front, owner of Kepler's Books and Magazines, speaks during a press conference with fellow small-business owners and educators on Wednesday (Aug. 17) at Palo Alto Bicycles. People had gathered to show their support for an e-fairness bill, protesting Amazon's special tax benefits. Photo by Veronica Weber/Palo Alto Online. Palo Alto's brick-and-mortar businesses that pay sales taxes are protesting Amazon.com's attempts to get an exemption for Internet sales it conducts in California. A coalition of small businesses from Palo Alto and Menlo Park held a press conference Wednesday morning (Aug. 17) at Palo Alto Bicycles to address the issue. Participants included Palo Alto Bicycles, Bell's Books, Kepler's Books and Magazines of Menlo Park, Chain Reaction Bicycles of Redwood City, wholesalers and the California Teachers Association. The group is taking part in a statewide campaign by the nonprofit group Stand With Main Street to raise awareness of Amazon's attempt to repeal a state law. California legislators approved the e-fairness bill in June to expand sales-tax collection to more Internet retailers. The state could receive an additional $200 million annually from the sales-tax revenue. Amazon has spent a reported $3 million to try to overturn the law through a ballot referendum that requires retailers with a physical presence in the state to collect sales tax. Amazon also fired thousands of California affiliate businesses that sell merchandise through its website because their physical presence would make the online retailer have to pay sales tax under law. But Palo Alto business owners said Wednesday that Amazon should pay, given that the state is cash-strapped and an exemption creates an unfair advantage for the Internet giant. Brick-and-mortar retail businesses already have difficulty competing with large e-tailers that offer products at lower cost, they said. Online-only mega-retailers that exploit the loophole have an advantage of nearly 10 percent, according to the group Stand With Main Street. Brick-and-mortar retail businesses that employ California workers are losing an estimated $4.1 billion annually in sales to online retailers. That number is expected to rise. Goldman Sachs estimates online shopping will increase from 4.4 percent of all retail sales to 17.1 percent in the near future. Since 2000, online sales have more than tripled. Jeff Selzer, owner of Palo Alto Bicycles, said that, though online retailers can offer discounted products, brick-and-mortar stores provide service and expertise. It's frustrating when customers try out new products and take advantage of the store's expertise, then turn around and buy the product online, he said. Paying sales tax is also about funding government services, he said. "The tax is not just good for local businesses but for the entire state," he said. "We've been doing business in this state for 81 years. Our state is not doing well. It seems to me absolutely ludicrous" for the state to exempt online companies from sales taxes while the tax base for basic services is shrinking, he said. Faith Bell of Bell's Books said Amazon is disingenuous when the company claims it doesn't have a physical presence in California but its Kindles are produced in San Jose and distributed in the Bay Area. Bell's has been in downtown Palo Alto for 76 years. Sales tax pays for local road and infrastructure repairs, she said. "I don't know how much money we've collected that went toward infrastructure in the state and county. "It irks me that others can sell their products without benefiting anybody but themselves," she said. Don Dawson, a California Teachers Association board member for Silicon Valley, said declining sales-tax revenue has been devastating for schools. For the past three years schools have lost $20 billion in funding statewide, affecting class sizes and school programs and shrinking class sections in all grade levels from kindergarten to college, he said. Clark Kepler, owner of Kepler's Books and Magazines, said his 56-year-old business nearly closed six years ago because it couldn't compete with Amazon. Kepler's was brought back to life because the community rallied on its behalf. There needs to be a mind shift if people want local retail to survive, he said. Retail businesses will gain some advantage against online sales "when people start to think of themselves as a resident of a community rather than as a citizen alone. "We're asking residents not to sign Amazon's petition," he said. Selzer of Palo Alto Bicycles said: "All we're looking for is parity." Amazon could not be reached for comment, but Paul Misener, Amazon's vice president of public policy, was quoted in the Wall Street Journal as saying: "This is a referendum on jobs and investment in California. ... At a time when businesses are leaving California, it is important to enact policies that attract and encourage business, not drive it away. Amazon looks forward to working again with tens of thousands of small business affiliates in California that were harmed by the new law's effect on hundreds of out-of-state retailers." Amazon is essentially stealing the sales tax money that could help our schools or pave our roads or improve our city emergency services. I think it is ethically wrong that some businesses have to pay sales taxes and others don't. How about all the local small businesses that are apposed to the Amazon law start encouraging their employees to picket the local Amazon office (A9.com in downtown Palo Alto). As a consumer, I agree with Amazon's stand since the laws regarding purely online business enterprises seem to be rather provincial and reactionary. With regard to "businesses that pay sales taxes", this simply means that customers pay the sales tax, and using Amazon we "do the math" to determine which costs less: sales price + tax (+ driving + time needed) or sales price + shipping method selected. Amazon is taking an important stand to force an updated definition of laws concerning local taxation. And how does Amazon get away with claiming they are an tax-exempt out-of-state company when they have an office right here in Palo Alto? ""They are not willing to pay for services we need," Faith Bell of Bell's Books said. Sales tax pays for local road and infrastructure repairs that have been cut back because of the state deficit, she said." Ms Bell's indignation is clearly misplaced--she needs to go after local consumers. Every taxpayer is required, by law, to pay the tax on out-of-state purchases when they file their income taxes each year. It is easier to go after a big company, than the local people. Do not forget that Amazon is providing with items at good prices during these hard economic times. Amazon should move, or be moved, towards paying taxes. It is unfair. Bricks and mortar have immediacy and in stock, Amazon has choice, reviews, convenience, no gas or time ... both have good and bad, but both should pay taxes. "but both should pay taxes"
Anon. You are a bit confused--when we buy something locally we pay the tax--not the business. The business just collects the tax and passes it on to the government. When we buy out of state items, we are supposed to pay the tax when we file our income tax forms. Ms Bell and others are upset because people do not or cannot pay more for products that can be purchased cheaper online. The "stifle competition" model may have worked in Palo Alto to make sure that grocery stores would not compete with JJ&F--times have changed. Yes, Amazon customers are required by law to declare their purchases and pay their taxes on their state income tax forms. However, Amazon customers are well known to be rampant tax cheats. Less than 5% pay their taxes. These tax cheats are hurting are schools and hurting our roads and hurting our police and fire departments. Just say no to tax cheats! It is time to eliminate income taxes and corporate taxes. We need a flat consumption/transaction tax, at the point of transaction. This includes all Internet purchases. > anybody but themselves without contributing to the greater good,"
Bell's books does not have much a web-sales presence, if at all. Their customers have to drive (typically) downtown, park, and use the public sidewalks--all of which have to be purchased, maintained, protected by police and fire services, and from time-to-time, deconstructed. The City is a silent partner to Bell's books, because if anyone is hurt on City property getting to Bell's books, they will end up suing the City, not Bell's Books. Amazon's customers, on the other hand, do not drive to any store, the Amazon store is not physically located in Palo Alto (or most any city), since its sales presence is "on the cloud". The City of Palo Alto does not provide the air, and someone is paying for the electricity that is needed to operate the Internet Access Devices. So, Amazon's customers, nor Amazon, does not make any demands on the City. Amazon does employ a parcel delivery service, which needs access to the City's roads, but those services are local, and they pay all the taxes that are being required of them as parcel delivery. As soon as e-Books replace p-Books, then the use of local parcel delivery services will diminish, as well as will Amazon's indirect use of our roads. Maybe Bell's Books should begin to look at their archaic business model, and openly recognize that they are running a cost-ineffective business, and that their use of public resources far exceeds the property taxes they are paying. Also remember too, that sales taxes are not paid by businesses--they are paid by customers, who are ultimately subsidizing dinosaurs, like Bell's Books. The Internet is disruptive. It is changing the way that business is conducted around the world. We can buy "on-the-cloud" these days, and have items that Bell's Books might not ever be able to acquire, in a few days. Businesses like Bell's are living on their last legs. Correct! From reading the various articles about this topic in real newspapers around the state, many of the so-called "Leaders" of this "moverment" seem to be very confused on this point, or are going out of their way to confuse the electorate. "However, Amazon customers are well known to be rampant tax cheats. Less than 5% pay their taxes. These tax cheats are hurting are schools and hurting our roads and hurting our police and fire departments. Just say no to tax cheats!" Protest--please provide us with some facts to back up this claim. You are making charges, accusing people of being criminals. Do not forget also that the Amazon model provides work for people that are associated with the delivery of the products and also provides jobs to the people that work for the company. As expected, Ms Bell and others are only interested in themselves--our business is hurting they say, without regard to the people outside of Palo Alto that are working thanks to Amazon. For the most part, sales taxes do not support the schools. (Refer to CA AB8 for details). Sales taxes are used, primarily, to pay the bloated salaries of government employees. Amazon, if it is lucky, will be a part of a broad-based effort to downsize government, and to force cost-effective management into the spend-till-you-see-the-whites-of-their-eyes mindset of local, and state, government. When you order online you typically pay shipping and sometimes if you need to return the product you pay it both ways. So making them charge sales tax will make it impossible for internet companies to compete. Perhaps Bells Books is charging too much? And I agree with whoever said we need a flat tax, but that is income tax, not sales tax, so it may not go to the same place. Sales tax is very high. No wonder everyone looks for ways to bypass it. Make it less attractive to bypass sales tax - lower it down. If Amazon is going to start charging sales tax - we will buy from China. > we will buy from China. The products are a little "cheesy", but the model is one that we will likely see more of in the future. I also thought that traffic was a constant problem in the city. With people shopping online, that will mean less people driving to stores. That should make some people happy. Yoriko, what do you think??? What will the state do with the extra sales tax dollars? What they always do -- waste and/or pocket. The payment of sales tax is the buyer's responsibility. Leave Amazon alone! "Faith Bell had much to say when the Varsity Theatre was refit into a Borders Books and Music in 1994-1996. "We Palo Altans don't want super-stores or strip malls here. Do you suppose the Long's Drug stores and chain bookstores will be shown off proudly in 50 years? Can't we keep this building (the Varsity) true to its nature and use?" Ms Bell is clearly against free enterprise and competition. SHe also feels that she speaks for all of Palo Alto and has decided where everyone should shop. "The products are a little "cheesy", but the model is one that we will likely see more of in the future." God help us! We may see more of this model in the future... Until Chinese workers demand better wages and benefits and their toxic junk becomes even less profitable... Soon thereafter these jobs will be shifted to the next cheapest county (with the loosest environmental regulations)…repeat …repeat…and then maybe just maybe in 50-100 years when the US is one of the poorest countries in the world we will see the tide turn and get all sorts of jobs building/assembling consumer junk. Why has every discussion in this country turned into a race to the bottom? A race to the bottom in public education, wages, product quality, etc. Poor countries will always be able to manufacture consumer junk cheaper than us. Is that what we really want? To promote the prevalence of Chinese consumer junk to the point where all domestic “competitors” go out of business and we have no other choice but to buy toxic Chinese junk products. Is that the direction we should be moving in? In all fairness Bell books or any retailer for that matter is required to pay sales tax on all items sold. While what was said in a previous post is true; retailers simply collect tax and distribute it back to the state, the reality is if they do not collect the tax the retailer still must pay the tax. The state requires that the tax be paid one way or another. Amazon has not and does not opporate under the same rules. It seems to me that is unjust. "In all fairness Bell books or any retailer for that matter is required to pay sales tax on all items sold. While what was said in a previous post is true; retailers simply collect tax and distribute it back to the state, the reality is if they do not collect the tax the retailer still must pay the tax. " This can be fixed by Congress at the national level. They should remove the "Internet Tax Exemption" now. Problem solved and all states and counties will receive sales tax revenue on purchases. The current tax laws are a government subsidy of high tech. Amazon should pay taxes. Kudos for the local business who took a stand here. > Amazon should pay taxes. Another example of people who don't understand the situation. Amazon pays all of the taxes it is legally required to pay. Mark Weiss is unfamiliar with how taxation of purchases works--as The-Internet-Is-Disruptive has pointed out, Amazon is paying all the taxes it is legally required to pay. Amazon IS NOT collecting tax revenue from out-of-state buyers, nor is it their job to. In California, it is the duty of the buyer to report and pay any taxes on out of state purchases on their income tax forms. Mark Weiss should go after his fellow Palo Altoans and not Amazon. (Web Link "He is a business owner"
and is not familiar with how taxation works???? It's true - the Internet IS disruptive. As Shakespeare wrote in Hamlet, “...there is nothing either good or bad, but thinking makes it so..."
With this in mind, I can only surmise that the passage stating "...Amazon customers are required by law to declare their purchases and pay their taxes on their state income tax forms. However, Amazon customers are well known to be rampant tax cheats. Less than 5% pay their taxes..." is a bad statement based on thinking and not in fact. To all who feel this is accurate, please share the specific official location where this law is documented. The thinking that states that “…business just collects the tax and passes it on to the government…” actually is, in my thinking, to be highly correct. Amazon is actually a green alternative to an "archaic" (borrowing again from this discussion board) business model, arguably helping the environment from "no driving required" to shop. Amazon also saves money for cities and their taxpayers by not adding more congestion, wear and tear, and potential situations requiring costly emergency response! Should Amazon also be required to compensate the State for lost gasoline taxes as well? Enforcing local taxes on “cloud” businesses is an nonsensical as 19th-Century trade tariffs. Laws should be made to safely and effectively work for how people live today and plan for tomorrow, and not try to pull everyone back in an attempt to find more public monies. Taxing companies “because we need to do this” only hurts the consumer, who (by the way) has ultimate choice for all purchases. svatoid, please stop putting words into other people's comments, and trying to spin them as if they do not know what they are talking about. The point is there is not mechanism for me to pay my sales tax to the state of CA on an Amazon.Com purchase, so you are just making a poor joke when you say everything is working as it should. However you care to spin it, what should happen is that Amazon needs to pay the state sales taxes for Amazon are the same as those for local retailer - period, the internet businesses do not need subsidies by the state. The first diversion of your tax dollars is exhorbitant pensions and comp for city employees. Get outraged over that. It is right in front of your face. "Amazon is actually a green alternative to an "archaic" (borrowing again from this discussion board) business model, arguably helping the environment from "no driving required" to shop. Amazon also saves money for cities and their taxpayers by not adding more congestion, wear and tear, and potential situations requiring costly emergency response! Should Amazon also be required to compensate the State for lost gasoline taxes as well?" Not sure parking your car negates the UPS/FedEx truck driving to your door? Anon-you clearly do not understand this whole tax issue. There is a line on your state tax form where you put in how much you purchased out of state and you pay the tax at that time. There is a mechanism to pay the state the taxes you owe. As I and others have explained retailers do not pay taxes on the purchases we make-we pay the tax, the retailer collects it and sends it to the state. On out of state purchases it is your responsibility to pay the tax, when you pay your income taxes. It is not amazon's job to collect those taxes. I think this one has been diced up very well. As for UPS & FedEx, those trucks are 1) more efficient than public road transit; 2) well outnumbered by cars; 3) operated by professional drivers. Palo Altans easily consume more products from online merchants such as Amazon than they purchase from local (often) full-price walk-in stores. Kudos to Amazon! I think they're solving the wrong problem. If the sales tax rate were 3%, this would be a non-issue. I'd like to see all these merchants start a campaign to lower the state sales tax rate. Amazon is doing a disservice to the state. They kick out all affiliates in the state and refuse to collect the tax. Amazon has an office downtown and they just operate it under a different company name. We are letting this huge company use every loophole imaginable to continue to not give back to the state. I say it is time for them to stop! With Bell’s Books having been in Palo Alto for 76 years, it stands to reason that they own their own building, and that its current property tax assessment pre-dates the initial 1976 assessment date for Prop.13. So, since Bell’s Books is so keen to see other’s paying more in taxes, just how much does Bell’s Books pay in property tax, the bulk of which goes to support the PAUSD, and about 9% of which goes to support the City of Palo Alto? So .. Bell’s Books pays about $840/year in property tax. This means that Bell's Books is contributing about $80/yr for City services via property taxes. This business is paying about $25,000 a year in property taxes. So .. Bell’s Books pays virtually nothing in property taxes, while complaining about their Internet-based competitors, who have no business presence in the state, not collecting sales taxes. Bell’s Books claims that they can’t compete (presumably) because of the “tax advantage” that Amazon has. Well, what about the “tax advantage” that Bell’s Books has because of Prop.13? Prop.13 gives Bell’s Books has a $10,000-$20,000 a year “subsidy”. Wonder if Bell’s Books would be ready to overturn Prop.13 to achieve “tax fairness” for everyone? We have to do one or the other - either Amazon must collect sales taxes or somehow every CA resident must be forced to pay their use tax. It's ridiculous that money that should be going to the state anyways is not. We have plenty of budget problems without letting everyone get away with not paying their dues. Article in today's Daily Post about the protest. The usual malcontents there--Clark Kepler and Faith Bell to name a few--who do not care about the traffic issue sin our city and have no problem with people polluting the air to drive to their stores. They do not care about people trying to save money in these tough times--it is all about them. Then we have a quote from a Don Dawson (board member of the CA. Teacher's Association union) where he states that that "amazon's refusal to pay sales taxes ends up cheating students" and he calls them scofflaws. Well, Mr Dawson, Amazon pays all of the sales taxes it is required to--it does not collect sales tax from customers that are out of state. Perhaps you should become familiar with the facts about sales tax payments before you go running your mouth. How about a compromise. Instead of having Amazon automatically add the state sales tax to California customers, have Amazon report California sales to the state. The state can then compare the Amazon data with your income tax return to see if you paid the mandatory use tax on out-of-state purchases. Fair? If you don't cheat on your taxes, this should not be a problem. It is disingenuous for Palo Alto Bicycles, Kepler's Books, and Bell's Books, to complain about some presumed 'unfair advantage' which Amazon has. Bell's Book, as pointed out, gets a huge discount *every year* on their property taxes. Prop 13: the gift that keeps on giving. Palo Alto Bicycles has advantages which Amazon does not. Namely: PA Bikes has a *service department*. I bring my bike there for service, for repairs which I cannot do myself, or don't have the time to do. I cannot send my bike to Amazon for service. OTOH, I do *not* buy higher-priced items at PA Bikes, namely, replacement tires, or jerseys. I pay roughly half on Amazon for these items, without considering sales tax or shipping, what I pay at PA Bikes. If PA Bikes could make an economic argument for the 2X cost difference (for instance, if they could provide proof of superior quality, via an REI-like warranty), then I would forego Amazon. But PA Bikes cannot and will not do this. So, Selzer is just looking out for #1, when he claims the playing field is 'unfair'. That's a bunch of hooey. Kepler's has struggled, but as with PA Bikes, has found a way to stay in business. Kepler's has a 'brand', and people have been loyal to that brand: people (like me) have bought memberships in Kepler's; and, people will pay huge ticket prices to hear authors like Jane Fonda, George RR Martin, or Carolyn Kennedy Schlossberg speak. Amazon cannot, or does not, have a membership program, or for-pay webinars. Finally: why does REI thrive, when other local business complains about unfairness vis a vis the etailers? REI has to compete with any number of online retailers, yet reports a vital, growing, profitable business, each and every year. My kids went through PA Schools. My property taxes and sales/use taxes pay for all manner of services. My donations to various local entities, including the schools, enhance their budgets. Saying that Amazon is somehow hurting local govt services, or local schools, is nonsense. Data: Palo Alto has budgeted $140M in revenue for 2012. $20M of this revenue comes from sales tax. The very large majority of this sales tax revenue comes from apparel and department stores, furniture and appliance, restaurants, food markets, office equipment, auto sales, and business services. I don't see anything in this list regarding books or bikes. And Amazon supplies almost nothing on this list. Nor would it, under the new CA law. $26M comes from property tax revenue. Amazon contributes nothing here. Nor will it under the new CA sales tax law. Transient taxes (hotels) contribute $8M. Utility Users Tax contributes $11M. Document Transfer Tax contributes $4M. Charges for Services (e.g., bill to Stanford for fire service) contribute $22M. Rental income contributes $14M. Amazon contributes to none of these. Go Amazon. Where do I sign? Why is the focus on Amazon. Chinese companies sell online. We may force Amazon to collect sales tax but can we force Chinese online stores to collect sales tax. It is a new world and a new reality. Fighting is futile. No state may tax interstate commerce. The California law to tax "internet sales" (as if they were in some way different than any mail order catalog sales) is and has been unconstitutional for over 200 years. It is that simple. Unless you're talking about trinkets on EBay, purchases from foreign countries are subject to import duties which are comparable to sales taxes. Does China have a physical presence in California? No. Apples and oranges, Misplaced. Amazon does, and was given the tax break to jump start its business online. Now it's very well established and should pay for commerce within CA. Or...........move to Oregon, where there is no sales tax. Ha! "Does China have a physical presence in California? No. Apples and oranges, Misplaced. Amazon does, and was given the tax break to jump start its business online. " Amazon does not have a physical presence in California. That is the whole issue. The say that they do not need to collect sales tax for California since they have no physical presence in the state. If that is not true, the please provide with the address of Amazon's location in California. If anyone was wondering why the KP people were missing from this rally by "local businesses", this article might provide a little insight. Amazon's office in Palo Alto is at the corner of Lytton & Alma. It's the building with the big A9 logo on the front (short for AMAZON.COM). "A9.com was created because we believe search is vitally important to digital commerce. Our Product and Visual Search technologies continue to set the standard in helping people find the products they want, whether online or in the mobile space. A9’s Advertising Technologies deliver highly targeted, optimized ads, helping customers discover new products, services, and content matching their needs and interests. We opened our doors in Palo Alto in 2003 and have grown to provide our services on a global basis. We have teams in Bangalore, Dublin, Japan, China, Romania and Luxemburg, in addition to our headquarters in downtown Palo Alto. In 2009, we acquired SnapTell, a Visual Search company. As A9 is a wholly owned and operated subsidiary of Amazon.com, we have the strength that comes from being part of a Fortune 500 company, and the flexibility and energy of a Silicon Valley start-up." They may have spun off from Amazon, but they are not Amazon. Anyway, if they were Amazon, the tax issue would be a moot point. The State of California does not recognize A9 as being Amazon. "Spun off" means they are no longer owned by Amazon. A9 is "a wholly owned and operated subsidiary of Amazon.com". In other words, they created a shell corporation to avoid paying California sales tax. They made a fatal logical error then caught by you. I shop Bells and Amazon. I have learned A LOT here! about Sales Tax, etc. Great debate. I am on the side of Amazon for this one, at least for now, for all the reasons cited. I will be sorry when Bells goes, if it does. You can call me Old Fashioned on some things and trying to go with the future on others... I support both places, and have loved this thread. Be nice to Faith though... she does a lot for the community. "In other words, they created a shell corporation to avoid paying California sales tax." Amazon in California---you do not understand the whole sales tax issue. Amazon is not avoiding paying California sales tax--I am sure when they purchase things in California they pay the sales tax. They are not collecting the sales tax from shoppers in California. It is up to the shoppers to report their purchases on their yearly income taxes and pay the tax to the state, it is not Amazon's job to collect that sales tax. Amazon is not breaking the law in any way. As I stated the stat eof California must recognize A9 as an independent company otherwise the whole issue of collecting sales tax (as oppose dto paying sales tax) would be a moot issue. If California thinks that A9 is a shell company (which it is not) then they can sue. "A9.com helps people find what they want on the world's leading e-commerce sites. " Clearly A9 performs a job that is distinct and different from Amazon. I plan to start boycotting Amazon today. Join me. Amazon occupies office and manufacturing building in our state, using street facilities, services and utilities in our state. Sales taxes do directly pay for these services. Amazon uses public streeets to have their prodcuts delivered via publicly subsidized delivery services. They should pay their fair share of taxes. I object to what thyey are doing. Frankly, their poor citizenship and attitude of entitlement disgusts me. An obligation that comes with using state services is that one shares the costs of maintaining them with fellow citizens. Don't forget that the children of Amazon employees attend California public schools. No sales tax means no money for public schools. Can't have it both ways. Don't forget that the children of Amazon employees and the children of Amazon customers attend California public schools. No sales tax means no money for public schools. Can't have it both ways. >> There is a line on your state tax form where you put in how much you purchased out of state and you pay the tax at that time. This is useless and inefficient and clearly does not work. The only way to do this is to do it at the seller's end. If they do not want to pay their taxes, then they should not be selling across state lines. "I plan to start boycotting Amazon today. Join me." I will pass, but you are free to boycott. "Amazon occupies office and manufacturing building in our state, using street facilities, services and utilities in our state." "Amazon uses public streeets to have their prodcuts delivered via publicly subsidized delivery services." UPS and FedEx are publicly subsidized? I am sure that Amazon pays a great deal the US PostalService for the stuff it ships. In fact, Amazon may be subsidizing the USPS!!!!
" They should pay their fair share of taxes. I object to what thyey are doing." "Frankly, their poor citizenship and attitude of entitlement disgusts me." "An obligation that comes with using state services is that one shares the costs of maintaining them with fellow citizens." Using Amazon cuts down on car trips and helps the environment. They pay for the state services they use--shipping costs etc. >> How about a compromise. Instead of having Amazon automatically add the state sales tax to California customers, have Amazon report California sales to the state. The state can then compare the Amazon data with your income tax return to see if you paid the mandatory use tax on out-of-state purchases. This is how and why rabid right wingers can sit around and claim the government is inefficient ... they damn well design it that way, getting their cake and eating it too ... and having everyone else pay for it as well. Look at the whole system and do what is the cheapest, most efficient and most easily regulated. That would mean Amazon paying their taxes. "Don't forget that the children of Amazon employees and the children of Amazon customers attend California public schools." Amazon in California--Since Amazon does not have a presence in California, hard to believe their children attend our public schools. The children of Amazon customers are supposed to pay their use tax on their annual tax forms. It is these people that are not paying their taxes. Amazon is not breaking the law or doing anything wrong. "This is useless and inefficient and clearly does not work"
But that is the law and that is the way sales tax is collected on out of state purchases. I suggest you contact your legislator about changing it if you find it :useless and inefficient"
"The only way to do this is to do it at the seller's end. If they do not want to pay their taxes, then they should not be selling across state lines." Anon, you do not understand the whole sales tax issue. Amazon is not avoiding paying California sales tax--I am sure when they purchase things in California they pay the sales tax. They are not collecting the sales tax from shoppers in California. It is up to the shoppers to report their purchases on their yearly income taxes and pay the tax to the state. What does Amazon get for a sales tax? Local businesses get the whole gamut of services. UPS pays lots of taxes. The greed rampant in these letters is disquieting. I am going to go out on a limb here and guess that "svatoid" is either an Amazon SHILL or an unemployed accounting school college drop out living in his parents basement... svatoid care to enlighten us on that? Not strictly true. Basic Aid Districts, like the PAUSD, do not get any funding from sales taxes--they get most of their money from local sales taxes. About 30% comes from the State, so it's possible that some of this 30% is derived from sales taxes. While this may be true, the suggestion that they are not paying their taxes is not only silly, but slanderous. So, the building where A9.com is located seems to be owned by local entities, that must pay about $160,000 a year in property taxes--which is what is mandated by law. While A9.com (a wholly owned subsidiary of Amazon) does not seem to the the actual owner of the building, it's very hard to believe that they are not paying the lease fees for the space they are occupying, and that the cost of the property taxes are not included in the lease. So, this building is generating $160,000 in property taxes, vs the $1K that Bell's Books generates. It is astounding that people living in Palo Alto (or posting on this thread) are so illiterate in the basics of property tax generation, and even the fundamentals of municipal finance. "I am going to go out on a limb here and guess that "svatoid" is either an Amazon SHILL or an unemployed accounting school college drop out living in his parents basement... svatoid care to enlighten us on that?" Yes, 1+1=2 you are out on a limb. I am neither a shill for Amazon (whatever that is--Amazon seems to be doing quite well and does not need any "shills") nor an unemployed accounting school college drop out living in his parents basement. I am gainfully employed at a local prestigious university. Are you enlightened now, 1+1=2? Amazing that the people in PA have no knowledge of how are tax system works. And some people, rather than finding out how it does work, dismiss my attempts to educate them but make stupid comments!! Learn the difference between paying taxes and collecting taxes that are passed on to the government. I will shop Amazon with or without sales tax. Why? I get free 2 day shipping, free returns and avoid the hassle of the stores. Oh and protest I pay my taxes every year! It is just more convenient for me. I hate shopping (especially at Christmas time). I am able to get what I want without dealing with rude customers snapping at clerks who are just trying to do their job. So svatoid is employed by a local prestigious university. Doing what? Picking on our valuable local citizens? Organizing Tea Party groups? well at least it isn't Stanford. "So svatoid is employed by a local prestigious university. Doing what?" "Picking on our valuable local citizens? " Which valuable local citizens are talking about? Kepler and Bell can criticize others, but we cannot respond? "well at least it isn't Stanford." The bottom line is that if there is any sales tax that is not going to the state, it is due to actions of the citizens of California and not Amazon. Others have pointed out the benefits of Amazon. It’s not sales tax that keeps me buying from Amazon and other etailers. The big benefits are convenience, huge selection, ability to easily search for the best price, free shipping (sometimes), online reviews, great support (from most places). I like Keplers, but why would I drive there (parking’s tough in Menlo Park), maybe not find what I want, pay full price if I do? Keeping track of sales tax is easy. Every time I buy something online, I plug the price into a spreadsheet. At the end of the year, I hand over my Use Tax list to my accountant. Regardless of whether or not people have to pay tax on Amazon purchases,it is unlikely that on-line shoppers will switch to shopping downtown at stores such as Bell's. Ordering online is easy. There's no parking hassle and no long lines. There are no rude assistants, and despite tax and shipping, the price is often lower. Why tax retailers to pay for roads and such in the first place? A gasoline tax would be more to the point. UPS would pay a lot of it, which would add to Amazon's shipping costs. In general, taxation should be tied to the service it provides as directly as possible. I just read the story about the merchants opposing the tax loophole. There were about a dozen merchants there speaking, including the head of the local Chamber of Commerce. But svatoid picked out Faith Bell to rag on. So many personal grudges. Disgraceful. You gotta pick on someone. "But svatoid picked out Faith Bell to rag on. So many personal grudges. Disgraceful." I also commented about Clark Kepler. Ms Bell is the one that has been quote din the papers. Ms Bell is the one who claimed to be speaking for all of PA when years ago she stated that Palo Alto was against Borders. Ms Bell is the one who has been pointed out as not paying much in the way of property tax. Ms Bell has chosen to become a public figure on this matter, therefore if Ms Bell has the right to criticize, the she also has earned the right to be criticized. I commented that Ms BEll's indignation is misplaced regarding taxes--she should go after the local taxpayers and not Amazon, I mentioned her comments regarding Borders and I mentioned the fact that, IMHO, she is only thinking of herself. There have been plenty of comments on Ms BEll by others. There is no personal grudge and the expressing of ,y opinion is in no way disgraceful. I notice that Amazon should collect salestax does not dispute any of the facts I have presented concerning Amazon, tax collection and the lack of general understanding of the tax system--he/she seems to be harping about my comments regarding Ms Bell. Strange. Does poor Walter feel that heis being picked on. Seems that people who cannot stand the heat should stay out of the kitchen. Especially those that have never hesitated to denigrate others. > Why tax retailers to pay for roads and such in the first place? The cost of government has become incredibly expensive, particularly with so many people being addicted to “entitlements”. So, government has taken to distributing its tax collection, so that people don’t feel the total “bite”. The current level of statutory taxation in the US is about 65% of one’s income (if one is actually paying taxes). Sending people a bill on April 15th for 65% of their income would likely lead to revolt, so governments have taken to collecting taxes using the “death by a thousand cuts” technique. Retailers engaged in business in California must register with the BOE and pay the state's sales tax, which applies to all retail sales of goods and merchandise except those sales specifically exempted by law. The use tax generally applies to the storage, use, or other consumption in California of goods purchased from retailers in transactions not subject to the sales tax. Use tax may also apply to purchases shipped to a California consumer from another state, including purchases made by mail order, telephone, or Internet. The sales and use tax rate in a specific California location has three parts: the state tax rate, the local tax rate, and any district tax rate that may be in effect. State sales and use taxes provide revenue to the state's General Fund, to cities and counties through specific state fund allocations, and to other local jurisdictions. While collecting all of the taxes at a single collection point might seem like a good idea, it would no doubt cause people to see just how expensive government has become, and question (ie – stop voting for) new taxes. There are also a goodly number of people employed by government in California (perhaps over 2M full and part time people). It’s doubtful that anyone knows what all of these people do (meaning why they need to be employed by government), but they have to be paid, and they expect very lucrative benefits packages too--which must be paid by the taxpayers. svatoid, I ain't poor. Not rich either. In this situation, I believe the tax burden should be on those using the facility. All Amazon uses is delivery services, and those delivery services are well taxed. Local sales taxes are collect - to enable local commerce - like building parking lots, parking enforcement, safety and security etc. These are the very things that are not needed for online commerce - why should the consumer pay for such. This topic should be decided once and for all by the Supreme Court, let that be the end of such crazy debates. For now, this a simply wasting time and energy on a lost cause. The California Board of Equalization reported yesterday that 0.42% of taxpayers filing income tax returns pay a use tax on out-of-state purchases. Probably some/many households do not make purchases for which they owe the tax. But many households do make purchases for which they should pay the use tax and don't probably including my family. But as Anon pointed out earlier this is clearly an inefficent way to collect the tax. We could have residents pay their regular sales tax instead of having it collected at the stores but we don't becasue point of sales collection is more efficient. So if sales tax should be collected on out-of-state purchases it should be done by the retailer. The record keeping and money transfer is much more easily handled by them. The law will eventually be decided by the Supreme Court I suspect but the record keeping is ridiculously easy for the online retailers. They have a zipcode on each transaction and that zipcode can be matched with a local tax rate. Online shopping does provide convenience for many households and is clearly a trend that will grow in the future.The imposition of a sales tax will seem normal to most shoppers and will not stop the slow shirkage of stores (like bookstores) selling items that many shoppers will prefer to buy online. I don't see any reason to exempt these transactions from a general purpsoe tax levied on the same kind of transaction done at a physical store. WHere does this number come from--is it the percent of total county taxpayers or the percent of tax payers that CBE knows purchased stuff out of state? Also, let say people travel to another state and buy something, do they owe the state of californi a tax on that or is the issue only for online purchases? The 0.42% is as stated the share of taxpayers filing incomne tax returns and as I said above includes both taxpayers who did and who did not make out of state purchases. When you go to New York and buy something you pay New York sales tax, not California sales tax. Are you arguing that online purchasers should pay taxes to the state whete the goods are shipped from? or where they are produced? or what exactly is your idea? Thanks, Stephen. So the headline is an example of a newspaper trying to push buttons by making up headlines. The truth is that there are no valid figures for what percent of people do not report out of state internet purchases. What about moving to a VAT system, like they use in Europe. You, Stephen, as economist may be more familiar with that system. Anyway, I agree that even if a sales tax is imposed it will not slow down the decline of local book stores etc. The local store owners say that want a level playing field, but that will not happen if they cannot match online prices, service and other issues. I think local store owners are used to the JJ&F model in Palo Alto, where the city imposed a grocery store size limit to protect JJ&F. Sorry but those days are over--local governments should not be limiting shopping options and should remember that we have a free market system based on competition. As others have also pointed out, shopping online means less traffic and pollution. Amazon charging sales tax won't help the downtown merchants much. Landlords need to lower their rent/leases to help businesses. Everyone/stores should have the same tax rates, seems pretty straight forward. "Everyone/stores should have the same tax rates, seems pretty straight forward." Does that include Chinese Online Stores? Lets not pretend that there is no globalization. China changes the entire equation regarding sales tax !!! The 100 lb gorilla in the room is not Amazon it is China. All I see here is a list of local businesses to boycott for trying to levy taxes unconstitutionally. The solution here is obviously not to target Amazon thus angering a huge set of the population. Rather the solution is to change the federal tax code. I'd be more than happy to lose Kepler's in the name of a fair tax system if they want to stick their neck out on this. Start sending customers an email statement ahead of tax time that tallies up the sales taxes that should be paid to the state, and let them know that a copy has also been sent to the IRS or state tax agency. Take advantage of the same technology that Amazon.com is using and make getting your business online your #1 priority. This very website has a solution you can use called www.shoppaloalto.com. I agree with Real Solutions. Amazon (and other high volume internet retailers) should send their customers an annual statement to help them figure out how much use tax to report. This tax is certainly constitutional and has been required for many years (probably many decades). Cheating on your taxes is a serious crime and should be treated as such. Tax cheats are stealing money from our schools and other critical government services. When I shipped some boxes back to PA from a major city in another state this summer, the UPS Store employee immediately recognized "Palo Alto" and told me that it is the #1 shipping destination for (all of) UPS! There is a thief calling catching thieves.How funny. There is a direct connection between brick and mortar buildings and local taxes that is missing between mail order and customer. What does the City of Palo Alto do for Amazon? A quick scan shows that “food” and “candy” are very large sources of “lost revenue” for the State. And there doesn’t seem to be an estimation for such loses from Amazon, or other on-line retailers. So, for people promoting “tax equity” for all, then maybe it’s time to end all of these discriminatory tax-free “islands” for some people, and force this tax on the backs of everyone equally. I'm going to stop shopping at Bell's Books and start shopping at Amazon. We don't need small businesses anymore. They are a thing of the past. I can buy everything I need from Amazon even with taxes way cheaper than I could even at Costco. The need for small business that can't compete even with the chains is purely one of people saying they want these places, and then never go. It is just eye candy, like many people who say they want a library but will never go in. I say Amazon keeps needing to pay taxes but let the small businesses die out. My question is unanswered; What does the City of Palo Alto and the County do for Amazon?